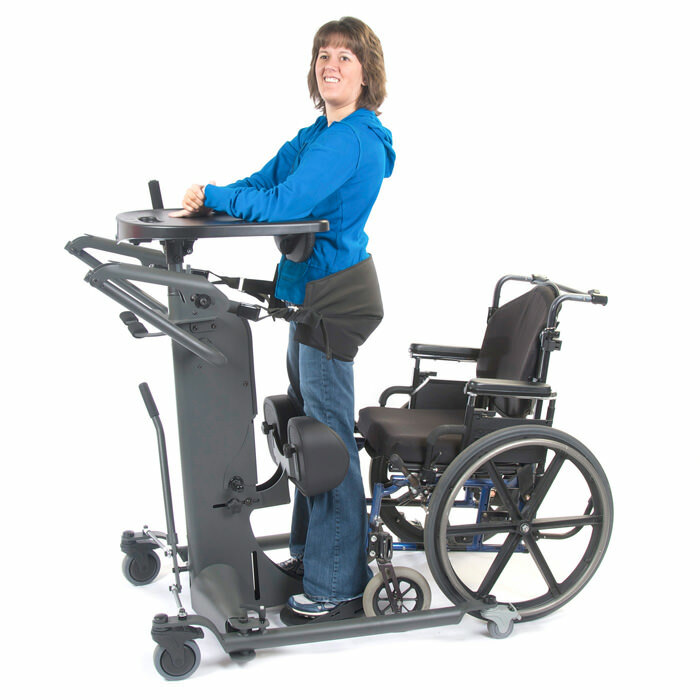 EasyStand StrapStand sit to stand stander is a strap-style stander which lifts user directly from wheelchair, bed or other seated surface into the standing position. 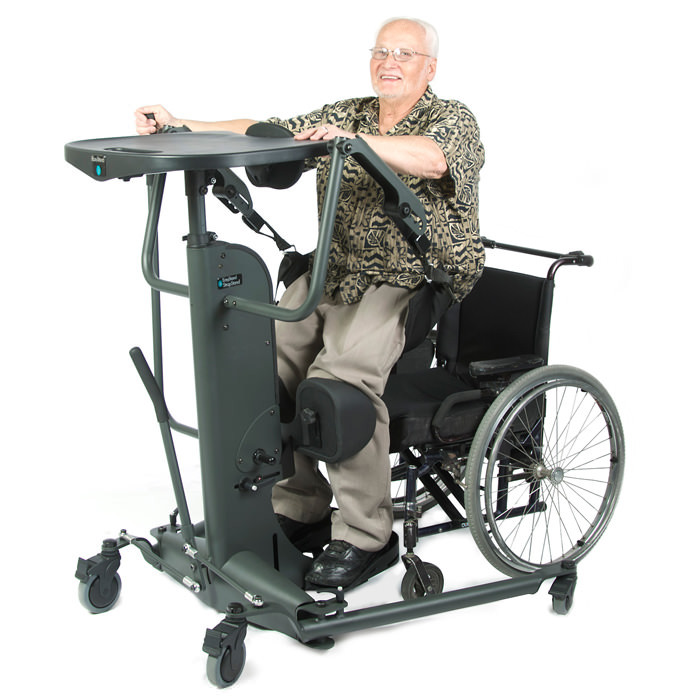 StrapStand sit to stand stander features adjustable lifting straps that work well for wheelchairs without removable arms and allow access to the tightest wheelchair seating. 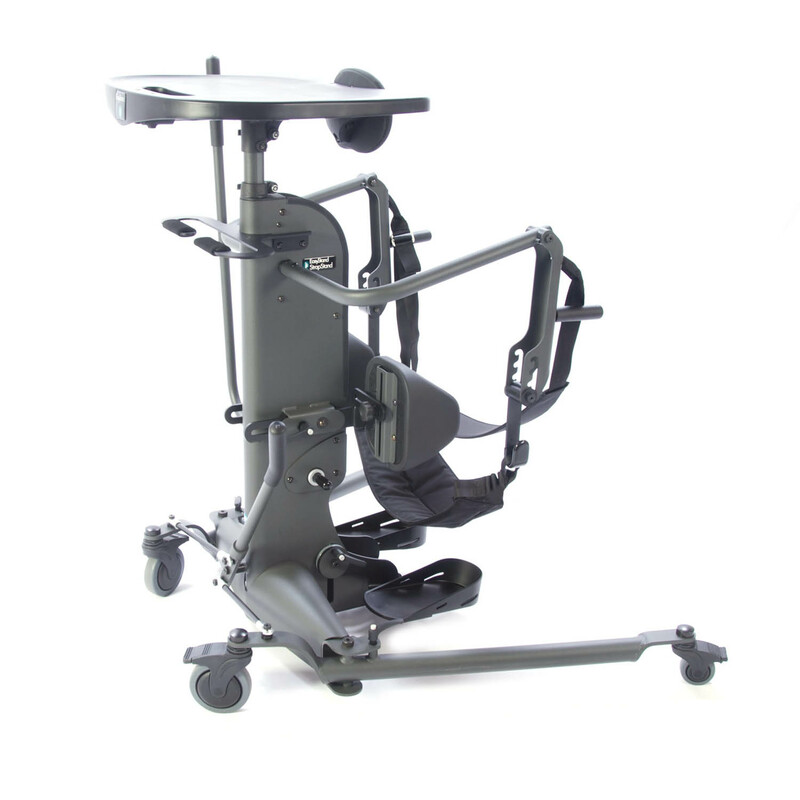 StrapStand uses dual-hinged lifting arms which gently raises a user vertically then gradually pulls them to the standing position reducing knee pressure, unlike other standers that pull a user into the knee pad creating excessive patella pressure. 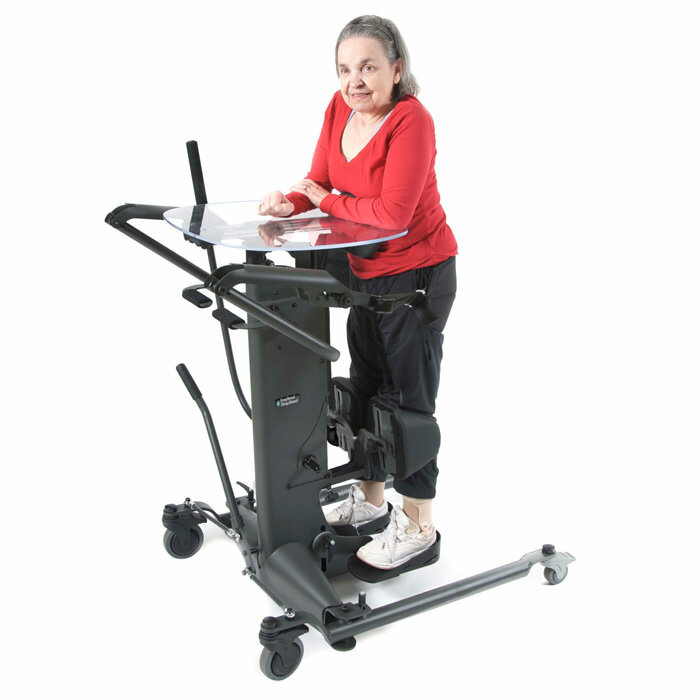 EasyStand StrapStand sit to stand stander's straps are designed for maximum comfort and by using a special fabric it is easier to place under a person that is seated. Each strap is sewn to form a pocket that securely supports the user during the sit to stand transition. EasyStand StrapStand gives people the option to stand without transferring. Height range 5' - 6'5"
Kneepad height range (Footplate to top of pad) 18" - 21"
Kneepad width (Center to center) 9"
Kneepad depth range (From back of heel) 6" - 9.5"
Front pad depth range (From back of heel) 2" - 12.5"
Front pad height range (From footplate to center of pad) 40" - 56"
Standard footprint 34" x 28"
Lifting strap - Small 9" x 25"
Lifting strap - Large 12" x 28"
Lifting strap - Extra large 14" x 32"
Adjustable lifting strap - Small 10" x 26"
Adjustable lifting strap - Large 12" x 29"
Adjustable lifting strap - Extra large 14" x 32"
Range of adjustable lifting straps 0" - 8"
Tray height (from footplate) subtract 1" or 2.5cm for acrylic 42" - 58"
Tray size (Molded or acrylic) 21" x 24"
Swing-out legs inside access (Wheelchair front width up to) 38"
Actuator handle extension Adds 7"
Upper body support strap pad size 5.5" x 24"
Upper body support strap (Adjustment range) 33" - 70"
Foot straps (Range over arch) 7" - 17"
Secure foot option (Range over arch) 7" - 17"
XL footplate-placement area (Each foot) 7" - 14"
Independent knee pad depth range (From back of heel) 3.5" - 8"
Independent knee pad height range (From footplate) 17" - 22.5"
Multi-adjustable footplates (Height from floor) 1" - 5"
Two years on the hydraulic pump. Ninety days on all other parts.